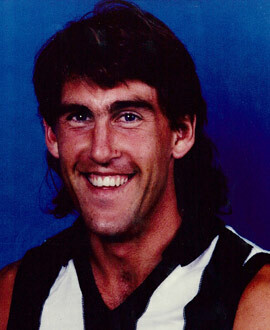 A tall and lean key position player, Starcevich is famous for his role in Collingwood’s 1990 premiership triumph. He was an outside chance to claim the Norm Smith Medal as best afield until a heavy blow from Essendon defender Terry Daniher put an early end to his day. Starcevich was recruited from East Perth, for whom he played 37 games for after he won the 1986 F. D. Book Medal as the club’s best and fairest player. His performances caught the eye of the VFL recruiters and he was recruited to Collingwood ahead of the 1987 season. Starcevich made his VFL debut in 1987 with Collingwood, debuting alongside six other young Magpies against Sydney in round one before kicking six goals from 26 disposals in just his second game against Carlton in round two. He played 13 games for the season, netting 23 goals and the Harry Collier Trophy as his team’s Best First Year Player at the tender age of 19. He kicked on in 1988, kicking 27 goals from 21 games, including four against Carlton in the Qualifying Final loss. He stamped himself as a finals performer when he kicked three goals from eight scoring shots in the loss to Melbourne twelve months later, but couldn’t quite nail down a regular place in the senior side the following year until September rolled around. He kicked four goals against North Melbourne in the final home and away game and, despite missing the Qualifying Final Replay, shone on Grand Final day, taking seven marks and winning 13 disposals in just over a half of footy before Daniher ended his day. He cemented himself as a regular in the three years that followed, only to be traded to Brisbane along with youngster Troy Lehmann at the end of 1993 season in exchange for Bears prodigy Nathan Buckley. After 124 games and 162 goals, Starcevich made a further 20 appearances for the Bears in his final two years to close his career with 144 games to his name. Following his retirement, Starcevich became Brisbane’s fitness guru, overseeing its players as they won three premierships in a row, two of which were against Collingwood in 2002 and 2003. He later spent time as a conditioning coach with St Kilda and soccer club Queensland Roar.